I can't believe that it was just a little over a week ago that I was in Miami and it was in the 80's! It is currently 8 degrees outside here in New York but I keep telling myself to think "warm thoughts". I went home to Miami for the Christmas holiday and of course, it was too short of a vacation. Whenever I tell anyone that I am heading down to Miami, everyone automatically envisions a vacation of relaxing on the beach, eating at the great restaurants, and heading out to the many bar and clubs but when I go to Miami, I spend most of my time visiting as many family and friends houses as I can. And I enjoy doing that! I grew up down there and I have known my friends since grade school, they are my family! It is hard being away from everyone but I always try my hardest to see as many people as possible. I will feel awful if I am down there and don't get to spend time with the people who I have known almost my entire life. Fortunately, I was able to fit in a few hours on Lincoln Road on South Beach, before heading back to my parents home for dinner, of course. I realized how much I missed it, being in the warm weather, the sun shining bright with people from all over the world all congregating on this popular palm tree lined street! 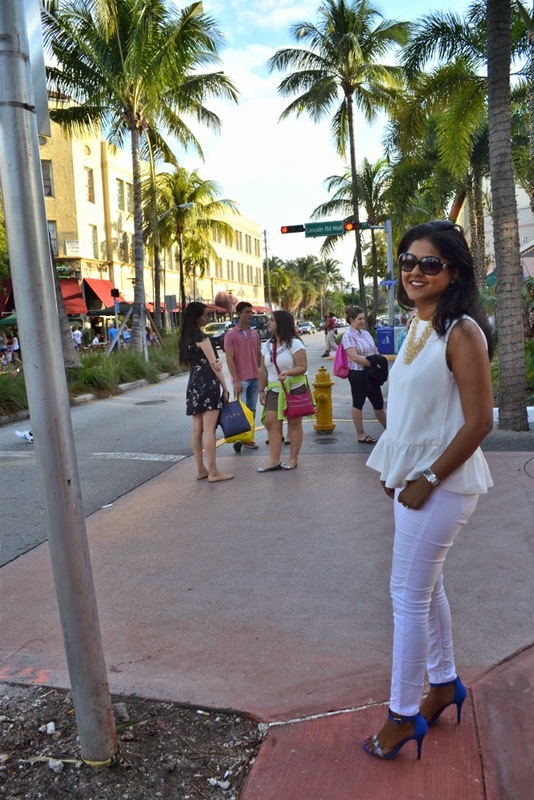 I couldn't help but reminisce to the days I would head out to Lincoln Road on a Friday night, after work for happy hour and end up hanging out with friends for hours on end, which we were able to do year round. Those days were so much fun! So for this visit, I chose to wear all white, since in Miami, there is only one season...Hot! I pulled out this French Connection top I purchased at the end of summer in Montreal. It is so light and airy. I didn't have the opportunity to wear it too often here so was very happy this trip gave my a chance to pull it out of my closet. 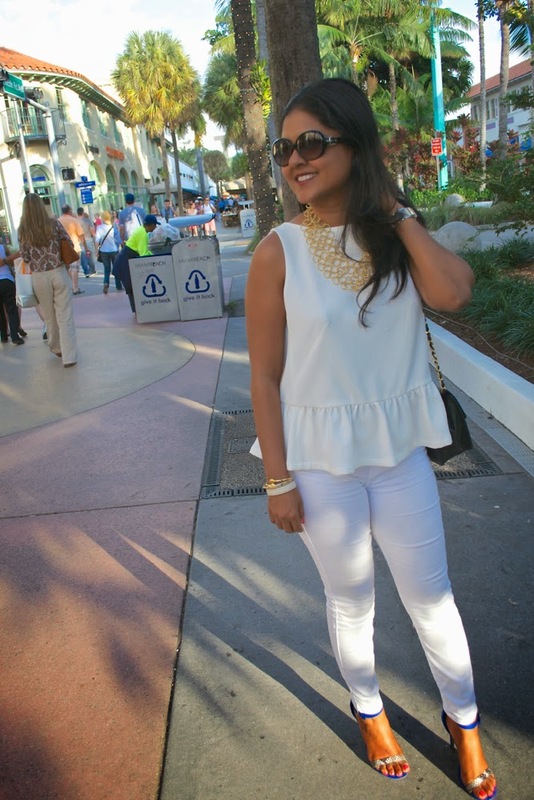 Also, I think white jeans are a staple for every woman's closet. They pair well with everything and brighten up any outfit. Once again, I bought a cropped pair of jeans and they fit me at the perfect length. 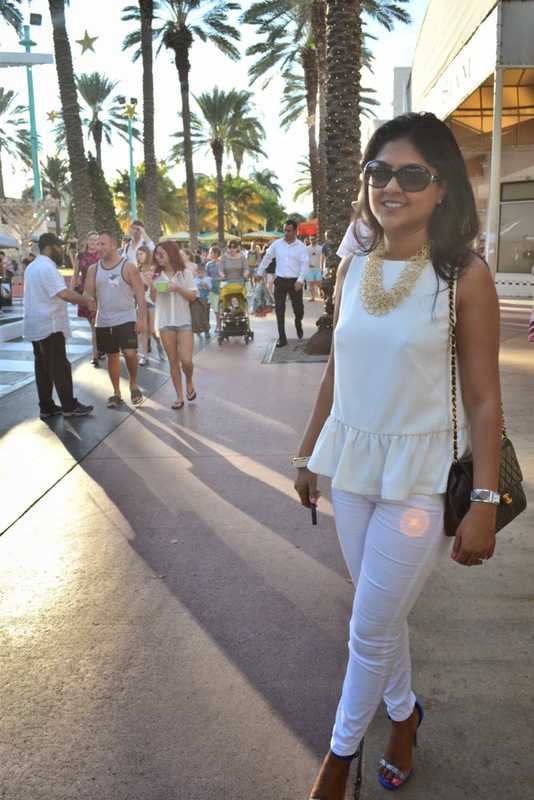 I love wearing all white, it is simple yet classy. It also serves as the best background to highlight this gold necklace. 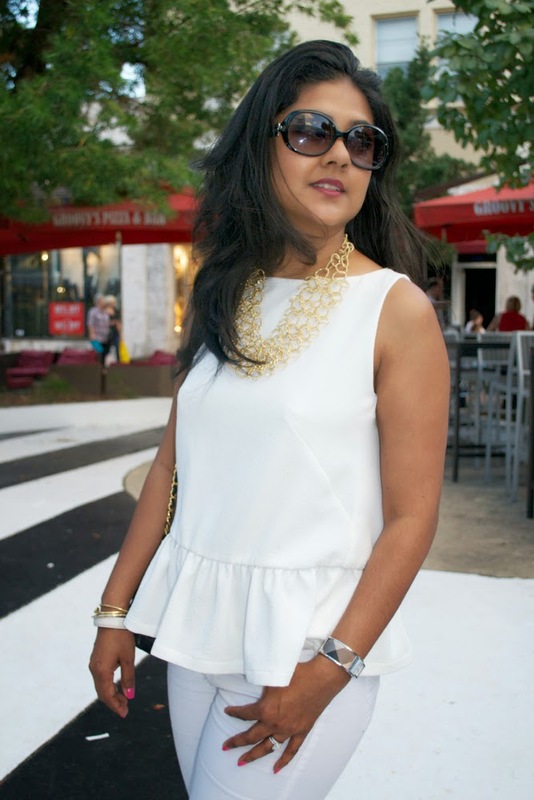 With just a few simple bangles, the necklace creates the focal point and takes this outfit from day to night along with my blue heels from JustFab. These shoes are so surprisingly comfortable and most importantly, affordable. So while I am walking around here in freezing temperatures, I will think back to the day when I was wearing open toe sandals and an open back top in Miami in December!